St. Thomas Aquinas will host Bonner Springs in the first round of the class 5A state playoffs on Friday night. The Saints will be the favorites in this matchup despite having one less win than the Braves. Aquinas started the season on a three game winning streak before falling to No. 1 in class 4A-I Bishop Miege, 37-20. The Saints are no strangers to the end zone averaging over 34 points per game and scoring 48 points or more on three different occasions. Aquinas has been led by a 1,000-yard rusher in James Cosentino, but the junior was injured late in the Pittsburg game and did not return. Despite its 31-21 loss to Pittsburg in the final week of the season, Aquinas won the district based on the three-way tiebreaker. Hosting a first round playoff game might just be what the Saints need to get back on the right track. 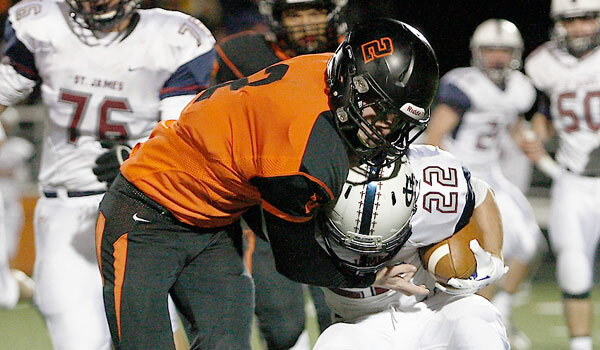 Bonner Springs supports a 7-2 record and brings a well-balanced offensive attack into Friday night’s contest. Junior quarterback Connor Byers has thrown for 1,610 yards and 18 touchdowns. Byers is also second on the team in rushing with 611-yards and eight scores, while Marcell Holmes leads the Braves with 767 yards and nine trips to pay dirt. Mixing the pass with the run to keep the Saints defenders on their toes will be key for Bonner Springs. If the Braves are successful in their game plan, it is possible for them to pull off the upset of the first round. Aquinas was one of the favorites to get to the state championship game going into the season and now time for them to show it. I’ll take the Saints in round one. Mill Valley hosts Pittsburg in the first round of the class 5A playoffs after beating KC Turner 59-28 to win its district. Although the Purple Dragons have to travel for their first round matchup, they are ranked third in this week’s Kpreps 5A poll. Mill Valley has made a mid-season adjustment and turned things around this season. The Jaguars started the year 1-4 but have won their last four games to host the first round contest. Mill Valley prefers the run over the pass, but they are not afraid to throw a wrinkle in to keep defenses guessing. Quarterback Logan Koch will look to run behind a big offensive line that features Kansas State-commit Evan Applegate. The Jaguars will also try to get the ball into the hands of Christian Jegen; a threat as a receiver or carrying the ball. Keeping the high-powered Pittsburg offense on the sidelines will be the Jaguars’ key. Mill Valley can put up points too, scoring 42 or more points in three of their last four games. Pittsburg’s offense goes through its Kansas State-commit in senior running back Alex Barnes. When Barnes is on his game, the Purple Dragons are difficult to stop. The senior running back has carried this team to their 8-1 record and is hoping for a much longer season. Pittsburg’s high-powered offense has been on point all season scoring 31 or more points in every game but one and has scored 50-plus points in four of those games. Kapuan Mount Carmel will travel to Salina South in a rematch of last season’s Class 5A state semifinal. The Cougars won a year ago 34-24. Both teams were hit hard by graduation, but both have prevailed to return to the playoffs. Salina South won their first five games of the season before a bad second half cost the Cougars at Derby in a 45-14 loss. The Cougars and Panthers were tied at seven at halftime before Derby scored 38 points after the break. South is led by 6-foot-6 quarterback Dalton Wassenberg. The senior signal-caller has completed nearly 60 percent of his passes for 1,507 yards and 22 touchdowns with only four interceptions. Wassenberg’s favorite target has been junior Dylan Becker who has 35 receptions for 861 yards and 14 scores. Becker’s classmate, Jacob Marcotte, adds 31 receptions for 444 yards and six scores. The Cougars have several options in the backfield in the form of Eric McCullough, Kieran Stegmaier, DeAngelo Turner, and Wassenberg. McCullough leads South with 696 yards rushing and three scores, while Stegmaier has rushed for 506 yards and Turner adds 388 yards and six scores. Both McCullough and Turner sat out of the Cougar’s 35-21 win over Great Bend with injuries. In their place, Sam Corona rushed for 75 yards and a score. Kapaun had a four game winning streak stopped with a 24-21 loss to Andover in district play. The setback meant the Crusaders had to knock off Wichita Heights last week to secure a playoff spot. Quarterback Brock Monty rushed for 80 yards and two touchdowns in the game and passed for 117 more yards. Monty is a dual threat player and has to be effective against South. The Crusaders also have to establish Alexander Norris in the run game and control the ball. Maize South will make the long trip out west to square off with Liberal in a 5A first round game. The Mavericks have reached the playoffs in each of their first five season, but this is their first time in Class 5A. Maize South qualified for the postseason by edging Maize 28-27 in the first ever meeting between the two schools on the gridiron. Quarterback Korie Frausto is in his second year starting and rushed for three touchdowns in the win over Maize. Still the Mavericks needed a late stop on a two-point conversion attempt by the Eagles to secure the win and the playoff spot. It was a statement stop and win for a program built on defense under coach Brent Pfeifer. Liberal reached the post season by sweeping through a District 8 schedule that included Goddard, Arkansas City, and Goddard-Eisenhower. The Redskins are in the playoffs for the second consecutive season after losing a first-round shootout 55-40 at Kapaun Mt. Carmel a season ago. Liberal’s current three-game winning streak is their longest since the 2008 season. After giving up nearly 44 points per game against Western Athletic Conference opponents in Week 3 through Week 6, the Redskins have surrendered only 11 points per game since. For Liberal to win, they’ll have to avoid penalties, turnovers, and consistently move the ball against a stout Maverick defense. Quarterback Jared Hasik must be effective in leading the Redskin offense.